The Supreme Court observed that principle of moulding of relief could at best be resorted to at the time of consideration of final relief in the main suit and not at an interlocutory stage. In an important judgment in the realm of insurance laws, the Supreme Court held that the insurer is not estopped from raising a plea of violation of the condition relating to delay in intimation warranting a repudiation of the claim, merely because it appointed a surveyor to assess the loss. While setting aside a Madras High Court judgment appointing an arbitrator ignoring the conditionality clause in an arbitration agreement, the Supreme Court observed that, even after the 2015 amendment insertion of sub-section 6A in Section 11 of the Arbitration and Conciliation Act, the arbitration clause has to be interpreted strictly considering the conditionality clause. The Supreme Court held that an application for setting aside an arbitral award will not ordinarily require anything beyond the record that was before the arbitrator. The Supreme Court held that an insolvency process cannot be put into operation when there is a pending proceeding challenging against an arbitral award. A bench of Justice Rohinton Fali Nariman and Justice Indu Malhotra (in K Kishan vs. Vijay Nirman Company Pvt Ltd) observed that filing of Section 34 (Arbitration) petition against an arbitral award shows a pre-existing dispute which culminates at the first stage of the proceedings in an award continues even after the award, at least till the final adjudicatory process under Sections 34 & 37 has taken place. In the context of rent control laws in Rajasthan, the Supreme Court held that, in a petition seeking eviction on the ground of defaulting rent, the provisional determination of the rent by the court is mandatory and without such determination of rent, no decree of eviction on the ground of default can be passed. While quashing case against distant relatives of a ‘husband’ accused of kidnapping the child, the Supreme Court cautioned the courts while proceeding against the distant relatives in crimes pertaining to matrimonial disputes and dowry deaths. The Supreme Court on Tuesday clarified that members of Customs, Excise and Service Tax Appellate Tribunal (CESTAT) can continue to hold office until the age of 62 years. The order was issued by a Bench comprising Chief Justice of India Dipak Misra, Justice AM Khanwilkar and Justice DY Chandrachud while disposing of an Intervention and Clarification Application filed by Rajesh Kumar Singh (Additional District and Sessions Judge, West Bengal). Mr. Singh was recently appointed as Member (Judicial) in CESTAT, New Delhi. The Supreme Court held that denial of voluntary retirement is permissible under the rules applicable in the State of Uttar Pradesh when services are required. The bench of Justice Arun Mishra and Justice S Abdul Nazeer observed that when there is a requirement of the services of an employee, the appointing authority may exercise its right not to accept the prayer for voluntary retirement. Every acquittal in a criminal case has to be taken with some seriousness by the investigating and prosecuting authorities, observed the Supreme Court bench in a criminal appeal. The bench of Justice NV Ramana and Justice Mohan M Shantanagaudar observed that motive has an important role as this case is based on circumstantial evidence. 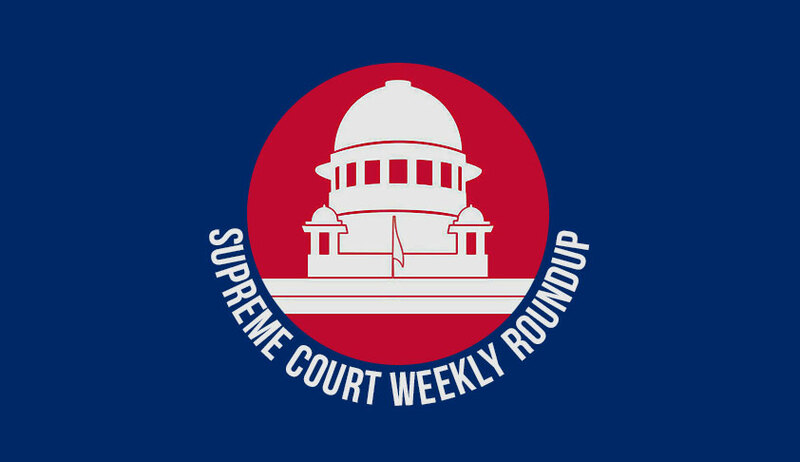 Dismissing a suit filed in the year 1964 by a son against his father, the Supreme Court observed that no co-coparcener has a right to challenge the sale made by the Karta of his family, once the factum of the existence of legal necessity stood proved. The Supreme Court delivered an important judgment qua the provision in the Hindu Marriage Act which puts a condition on a divorcee in contracting a second marriage. It has been held that the protection that is afforded by Section 15 of the Hindu Marriage Act is primarily to a person who is contesting the decree of divorce. A Bench headed by Justice Madan B Lokur of the Supreme Court expressed shock and surprise at the discrepancy in two surveys which showed a difference of two lakh children lodged at child care institutions. The Supreme Court held that remand by the Government of India to Medical Council of India for a review does not place any restriction of verification to only the deficiencies pointed out earlier and that the MCI is competent to conduct the inspection regarding the compliance of the minimum standards as prescribed by the regulations as well. Enhancing the compensation awarded to a man by the Motor Accident Claims Tribunal by almost three times, the Supreme Court observed that the purpose of compensation under the Motor Vehicles Act is to fully and adequately restore the aggrieved to the position prior to the accident. Reiterating that suspension must necessarily be for a short duration, the Supreme Court upheld a Madras High Court judgment that had quashed the disciplinary proceedings against an Inspector General of Police in Tamil Nadu and revoked the suspension.